Dante Alighieri (1265-1321) was a Florentine poet and politician. He was involved in the fights between Guelphs and Ghibellines and lived when Florence was the largest town in Europe. The age of Dante is very important for Florence. The city was expanding very fast and was starting the construction of the buildings that, even today, are the symbol of the city: Florence Duomo, Palazzo Vecchio, the churches of Santa Croce and Santa Maria Novella. Political involvment caused Dante to be banished from Florence in 1301, making him nostalgic, but also resentful towards his own city. From his exile, Dante wrote the greatest poem of Italian literature: the Comedìa, later named Divina Commedia (Divine Comedy). The protagonist of the epic poem is Dante himself, making an imaginative trip in the afterlife, as seen by a medieval Catholic believer. The poem is split in three parts: Inferno (hell), Purgatorio (purgatory), Paradiso (paradise). Dante’s Inferno is the very first part of the poem and also, by far, the most interesting. 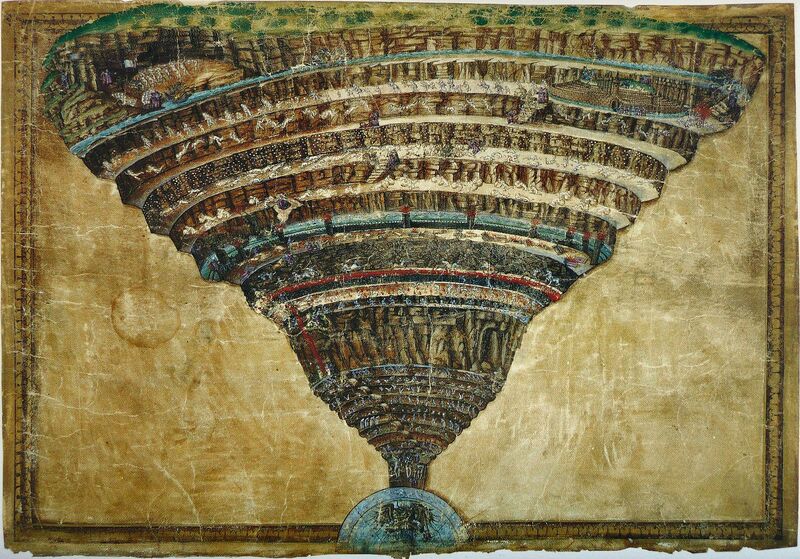 Dante’s Inferno is a funnel cave underground (exactly beneath Jerusalem), which goes down to the center of Earth. The shrinking floors Dante finds while going down the cave are called circles. Each circle is a place of damnation, dedicated to a particualr sin. Sinners are punished with a contrappasso (sort of karma effect), being forced, when possible, to do the opposite of their sin (often metaphorically). 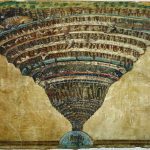 What’s really cool in Dante’s Inferno is that the poet doesn’t just describe how the place is, and which is the punishment for each sin: Inferno is populated with real people, mostly Florentine, but also Popes, Cardinals and more important historical characters that deserved to be there (in Dante’s opinion, of course). Recently, Dante’s Inferno became popular because of Dan Brown’s Inferno. In this novel by Dan Brown (2013), which unfolds in Florence for the most part, the protagonist, Robert Langdon, needs to decode a map: it’s Sandro Botticelli map of hell (click picture to enlarge), drew around 1495, when Dante’s Inferno was already a very famous epic poem. Follow the trail of Dan Brown’s 2013 ‘Inferno’ novel on a half-day walking tour, led by an expert local guide! 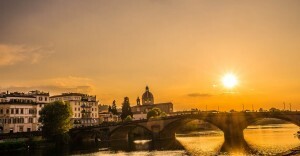 The international bestseller, based on Dante Alighieri’s ‘Divine Comedy,’ is set in Florence and several city attractions feature in the book’s mysterious plot. Hear stories of the main character, code-cracking Harvard professor Robert Langdon, and visit key sites like Palazzo Vecchio’s secret passageways and the Baptistry of Florence. If you are eager to see more, upgrade to a full-day tour and enjoy a skip-the-line tour of the Uffizi Gallery and Vasari Corridor, too. Bonus ticket! 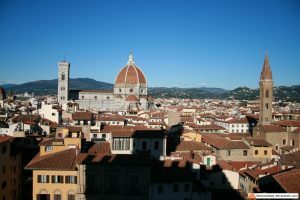 Both tours also include a combination entrance ticket for independent access to several top Florence attractions after the tour: Opera del Duomo Museum, Crypt of Santa Reparata, Brunelleschi’s Dome and Giotto’s Bell Tower. A private tour in Florence to discover the places and the mysteries mentioned in the novel by Dan Brown. Nine circles, seven sins, a terrifying secret. Revive the book and the movie with our expert guides!